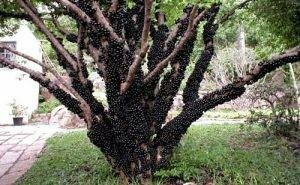 The jaboticaba grape is a tree plant originating from Brazil. It is a blend of grapes, avocado and fruit lychees make this one fruit to be excellent in Indonesia The jaboticaba grapes are famous for their uniqueness and special fruit flavors. Plant. Uniquely, the difference in taste also appears in accordance with the age of the tree. This fruit grows well in the tropics and promises as a fruit variety of Indonesia's mainstay. Judging from its characteristics, the Brazilian tree is different when compared to the grapes in general, this jaboticaba fruit can grow big, branched a lot, standing upright, woody and not creeping. The jaboticaba grapes when young are green and stick to the trunks of the tree, if the ripe sticks of this fruit will turn the color purple black with white flesh of the fruit. Jaboticaba grapes can be consumed directly and can also be processed into beverages or jelly. This fruit plant is able to grow up to hundreds of years. 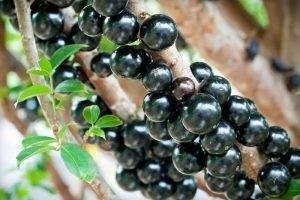 In addition, the jaboticaba / Brazil Fruit Juice is able to prevent aging and help kill cancer cells.